The Trump administration will order the Palestine Liberation Organization to shutter its Washington, D.C., office in a bid to increase pressure on Palestinian leadership amid stalled peace talks. 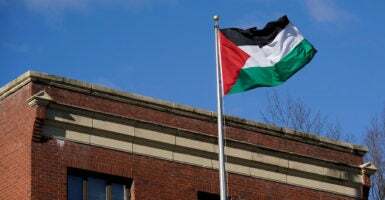 “We have been notified by a U.S. official of their decision to close the Palestinian mission to the U.S.,” PLO Secretary-General Saeb Erekat said in a statement Monday, according to Al-Jazeera. National security adviser John Bolton is expected to announce the closure in a speech to the conservative Federalist Society on Monday. The closure of the PLO’s Washington office would be the latest in a series of punitive measures the Trump administration has taken against Palestinian leadership while the White House develops its yet-to-be-revealed peace plan. Under President Donald Trump, Washington has sought to slash financial support for the Palestinian organization, arguing that U.S. aid rewards corrupt and intransigent behavior on the part of Palestinian leadership. Monday’s announcement comes weeks after Washington said it would cancel over $200 million in direct assistance to the West Bank and Gaza. The Trump administration has also decided to withdraw all U.S. funding for the United Nations Relief and Works Agency, which administers aid programs for Palestinian refugees and their descendants. The decision to shut down the PLO office in Washington was prompted in part by the organization’s support for prosecution of Israeli leaders in the International Criminal Court, according to Bolton’s prepared remarks. The Trump administration in 2017 warned that it might close the office after Palestinian Authority Mahmoud Abbas called for the investigation and trial of Israeli leaders in the court and other international legal bodies. The U.S. is not party to the treaty that created the International Criminal Court and has long rejected its jurisdiction over American citizens. In his Federalist Society speech, titled “Protecting American Constitutionalism and Sovereignty from International Threats,” Bolton is expected to vow that the U.S. will use “any means necessary” to shield American citizens and friendly allies from International Criminal Court prosecutions. Bolton’s speech will also lay out possible punitive action against any nation that cooperates with the court’s investigations of the U.S. and its allies, including cuts to foreign aid and military assistance. Bolton is further expected to threaten economic sanctions against the court itself, The Wall Street Journal reported.